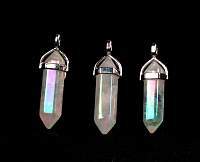 Angel Aura Quartz Double Terminated Faceted Point Pendant is a clear quartz crystal that is heated with Platinum and Silver, which makes its coloring turn to a silvery rainbow soft iridescence of colors. 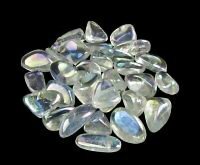 It is also known as Opal Aura or Pearl Aura. 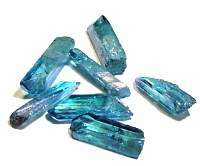 Angel Aura crystal is said to be a stone of high spiritual energy and is helpful for protecting, balancing and energizing the aura. 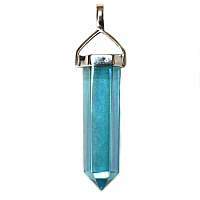 It is said to help with communicating with the angelic realms, the Higher Self, inner wisdom and attuning to one’s spiritual purpose. It can help one to meditate and find their true path in life. Meditating with this crystal allows one to enter a state of serenity and peace, purification and rest, Angel Aura is used for past lives recall. Its protective qualities can bring peace and tranquility. 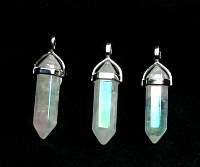 Double terminated crystal and gemstone points radiate or absorb energy at both ends, causing them to channel energy in two directions at once. 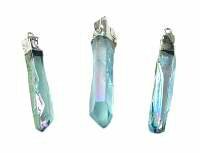 The six sides of a crystal or gemstone point represent the first six chakras. 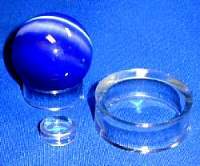 The top termination represents the crown chakra and the base of the crystal is the root chakra. 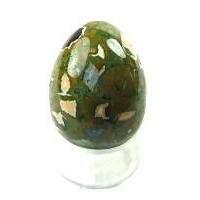 Stone size is approximately .25 inch wide and 1.5 inch long. 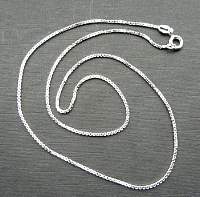 The total length including the sterling silver bail is 1.75 inches.